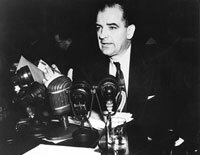 The speech by Joseph McCarthy jolted the post World War II US administration into persecuting communist infiltrators. The number went up to 207 and dropped down when McCarthy wrote to President H Truman claiming that “we have been able to compile a list of 57 Communists in the State Department.” It really didn’t matter whether the list had 205, 207 or 57 names. The fact that McCarthy had attached a number to his accusations made them substantial to ignore. The US Congress was forced to hold hearings to attempt to salvage the reputation of the State Department. In Proofiness, The Art of Mathematical Deception, journalism professor, Charles Seife writes an exact number, like McCarthy’s 205 Communists, is easier to believe. Seife calls the practice of using numbers for impure ends, proofiness. According to Seife, trusting a number too much can be dangerous. It is a phenomenon he calls disestimation, and it happens when people take a number far too seriously. In the US, McCarthy’s accusations led to a witch hunt of people suspected to be communist. The witch hunt happens sometimes even today. Seife provides other examples of proofiness. For instance, when the US administration said in 2004 that its tax cuts would save the average family $1,586; it was technically correct but misleading. If we eliminate the huge refunds received by the top two per cent, the actual savings for an average American family was less than US $650.